Shaving with a double edge safety razor can be intimidating for newcomers. I was a little nervous about putting a bare blade close to my neck after years of cartridge shaving. I understood that proper preparation and technique was necessary to get a great shave without cutting myself, but I wasn’t sure if I was ready for DE shaving. I wanted to start small, and not sink a bunch of money into shaving in case I wanted to go back to cartridges — or throw in the towel completely and grow my beard back. After researching beginner razors online, I settled on the Lord L6, which I reviewed back in July. It was known as gentle razor, and at about $13 delivered was about as low-risk as you can get without buying something vintage. However, as time passed and my technique improved I realized that I wanted a little more from my razor. Although I stopped nicking my skin I wasn’t getting a super close shave. I even used the infamous Feather blades from Japan, known for their sharpness. I knew one of the drawbacks of the Lord L6 was that it was lightweight. It had a hollow handle and was made out of lightweight materials. Vainly, I was bored by its all-metal look. I started looking for the next step in my shaving evolution, preferably in one of my favorite colors: orange or black. Edwin Jagger also has a reputation for making cost-effective razors. The DE89 is an oft-recommended starter razor. However, the DE89 is all-metal like my L6, and I wanted something visually different. I decided on the DE86BL, which came with a faux black ivory handle. Here’s my review of the DE86BL, and thoughts on what I’d do differently if I had to buy it again. The Edwin Jagger razor is very handsome. I knew I was upgrading my gear when I picked it up for the first time. It felt heavier and more substantially made than the Lord L6. The solid handle and the big head felt great. The handle is shorter than the L6, but overall the DE86 is well balanced. Longer handles are frowned upon among double edge shaving veterans. 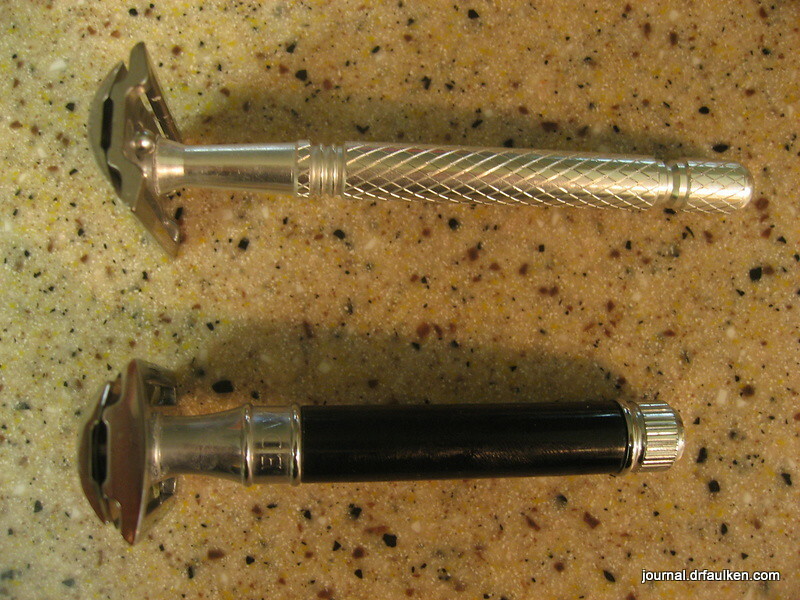 Longer handles allow for more force to be exerted while shaving, which is generally considered poor technique. Shorter handles also allow for more control, and more feedback from your face while shaving. However, shaving n00bs are encouraged to give longer handles a try, as it is likely to mimic learned biomechanics from cartridge razors. Cartridge razors have longer handles because you have to exert some force on your skin to get a good shave. A longer-handled razor like the L6 or some of the longer-handled Edwin Jagger DE89 variants are good transitions for beginners. Anyway, the DE86BL has a handle shorter than the L6 but longer than the Yuma (which I bought on a lark and is the subject of a review much later in time). It took about a week to learn how to shave with the DE86. I paid for it with some blood. It was immediately obvious that the heavier head made for closer shaves, and I had to revert to almost zero pressure in order to avoid accidents. Despite being shorter than the Lord L6 razor, the Edwin Jagger DE86BL is heavier and more substantial. How much heavier is the DE86BL than the Lord L6? Twice as heavy. The L6 is 1.2 ounces, the DE86BL 2.4. The head shape of the DE86BL is nice and round on top. This is helpful for new shavers because it helps us get the proper shave angle of 30°. Start at 90° and tilt the rounded head until the bottom edge rests gently on your skin. There are some exceptions, but for the most part it’s easy peasy to find the most optimal angle. The space between the head and the “comb,” the part that touches your face, is about the same as my L6. This is another happy circumstance in transitioning from the L6 to the DE86BL. Overall, the Edwin Jagger DE86BL is a great razor, except for one thing, and it’s critical: the handle is very, very smooth. It is hard to hold onto while shaving, and several times I was worried about dropping the razor into the sink — until it happened. Worst case scenario was that I banged the comb up. If the head became offset it was doomsday for my razor. Next worst was if the razor landed on the edge of the blade — not a huge issue but a wasted blade. Instead, I dented the handle pretty good. Up until last week I continued to shave with my banged-up DE86, but I regretted trading form for function. If I had to do it over again, I would have bought the DE89 since it has a knurled, textured handle. I’m not sure why Edwin Jagger doesn’t offer this for the DE86, but it’s a major weakness to an otherwise great razor. 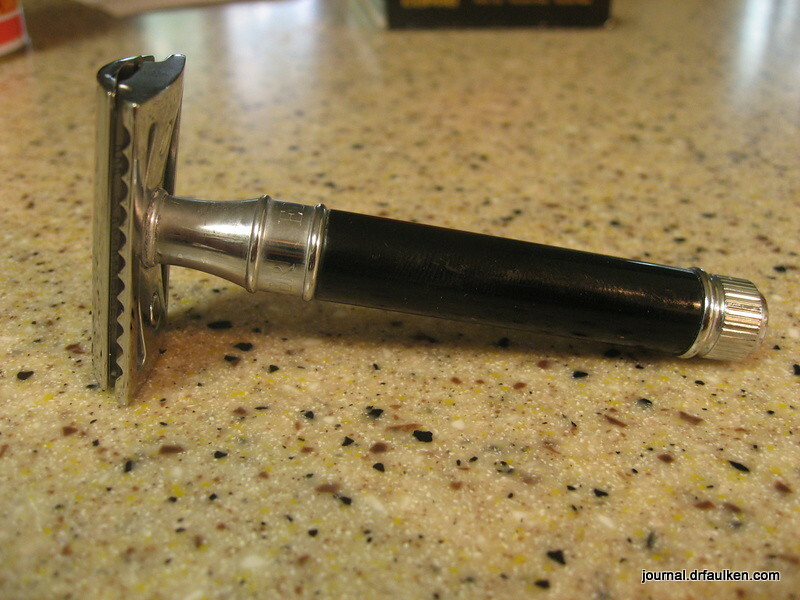 I’m currently shaving with a vintage Gillette Super Speed with a black knurled handle. It’s a little bit lighter and I miss the massive domed head of the Edwin Jagger, but the additional grip provided by the Gillette’s grip makes a ton of difference. Should you get the Edwin Jagger DE86BL? I’d have to say no, unless you have a black fetish. I still like the Edwin Jagger DE8x series, and recommend you get the DE89 instead. Not recommended due to the smooth handle — get an Edwin Jagger with a knurled grip instead.